Dylan remains a musical chameleon, out of time, out of step. He was once considered the cutting edge of Rock & Roll at the zenith of his powers and prowess in the mid-60’s, a pioneer forging bravely and boldly into new frontiers fueled by uncanny genius, chaos, and amphetamines. It may be a little startling however for people just being introduced to his modern recordings. His new sonic direction can actually be traced back to two overlooked instances. His two modest covers albums of old-time folk and blues standards with As Good As I’ve Been To You and World Gone Wrong released in the early 1990’s. Ever since “Love and Theft” this has been thoroughly emphasized by Dylan and he has been retreating back into the mist with the ghosts of early forms of American music, a melting pot of influences. Some long-forgotten, whether it be Jazz, Western-swing, folk, parlor & murder ballads, blues, or the exciting primal dawn of Rock & Roll from the 1950’s. 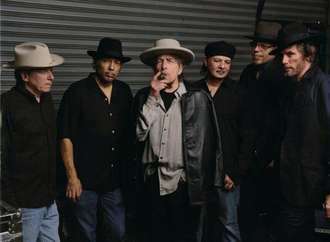 Dylan rediscovered his muse with the cacophonous eclectic roots of American music giving his career a much needed rejuvenation. His ventures into the past have revitalized his career and he owes a great debt to his latter-day Renaissance to a sound that’s familiar yet refreshing. This is the case for the entire record. It’s the most musically diverse Dylan’s made perhaps ever. Certainly since his career rebirth beginning with Time Out Of Mind. “Soon After Midnight” is a lovely lilting number akin to “Spirit On The Water” from Modern Times that at first feels like a gentle swooning serenade but inauspicious nature creeps in again as Dylan sings that he’s been down on the “Killing floors” and threatens to drag the corpse of a character named Two-timing Slim through the mud. “Narrow Way” is a rousing roadhouse rocker that shakes all the dust off the Old Guard and where the body count on Tempest really begins to pile up. “There’s a bleeding wound in the heart of town” from the British burning the White House down as Dylan proclaims, “This is hard country to stay alive in/ Blades are everywhere and they’re breaking my skin/ I’m armed to the hilt, and I’m struggling hard/ You won’t get out of here unscarred”. It’s a rarity on this record but Dylan adds a little humor here talking of his “Heavy-stacked woman” and that he’s going to have to bury his face between her breasts. “Long And Wasted Years” is a heartbreaking ballad of a deteriorated relationship amongst other things and recollections of better days from the past. Dylan’s destruction becomes sensationalistic as he proclaims, “I think that when my back was turned, the whole world behind me burned”. He even drops an autobiographical line yelping, “I wear dark glasses to cover my eyes/ There’s secrets in them that I can’t disguise”. He’s certainly playing it close to the chest for a man that’s spent a large portion of his career shrouded behind the veil of Ray-Ban Wayfarers and Aviator sunglasses. “Scarlet Town” is the name of the town borrowed from the traditional folk song “Barbara Allen”. You can picture “The Man In The Long Black Coat” from Oh Mercy as a wraith prowling the streets of Scarlet Town as a forlorn banjo trots and a fiddle weeps in the background. It’s a town populated by nefarious beggars, insidious misfits and lascivious maidens. It feels like a biblical overcast of locusts rolling into the neighborhoods as it teeters, trapped in purgatory between utopia and dystopia with the end being near yet it’s also where the seven wonders of the world dwell with “The evil and the good, living side by side” in Scarlet Town. The “Mannish Boy” bluesy romp of “Early Roman Kings” is dominated by David Hidalgo’s accordion pumping Tejano ventilator blues into its lungs, similar to “My Wife’s Home Town” from Together Through Life. Dylan tells of the early Roman kings as infamous tyrants, “They’re lecherous and treacherous”, but looking so good as monsters in their shark skin suits, bow-ties, high-top boots, wearing fancy gold rings with all the women going crazy for them. Dylan wails with a craggy hubris, “I ain’t dead yet, my bell still rings/ I keep my fingers crossed like the early Roman kings”. Dylan bangs his gavel unapologetically singing, “I can strip you of life, strip you of breath/ Ship ya down, to the house of death”. And when you try to barter for your freedom, his reply? “Ding dong daddy, you’re comin’ up short”. The lyrics on Tempest have an incredible range from tender beauty to horrific apocalyptic visions. His wit and metaphors are sharp with deadly force, leaving naysayers laid low. Dylan’s Tempest isn’t only dark, it’s defiantly dark. The prevailing theme is Bob Dylan is a survivor. He’s walked down some of the nastiest roads and he’s still standing. Dylan says it best in “Pay In Blood” as he roars, “How I made it back home, nobody knows/ Or how I survived so many blows”. Dylan’s last 15 years of mind-boggling success make the 20 uneven and misguided years that preceded it all seem like a ruse. Only one person knows that for sure, and only one person probably ever will, Bob Dylan. His accomplishments and accolades are numerous since the turn of the Millennium alone: An Academy Award, Golden Globe Award, New York Times Best Seller, Pulitzer Prize winner, and the Presidential Medal of Freedom to name a few. Add to that his continuing indomitable Never Ending Tour and incredible body of work since 1997 with Time Out Of Mind, “Love & Theft”, Modern Times, Tell Tale Signs, Together Through Life, and now his best of the bunch in Tempest. Dylan is a national treasure, the most important, profound, and influential musical artist in American history. 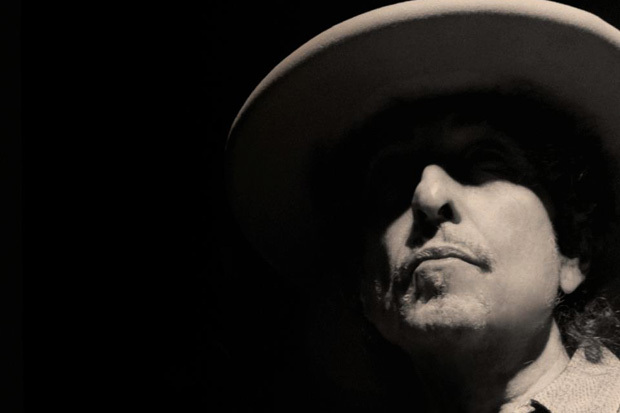 A new Bob Dylan record isn’t just another release, it’s an event. Dylan is seen as a preacher and prophet in millions of people’s eyes, just as holy as any religious denomination, perhaps holier. Oh preacher, what tricks have you yet to show us? What tales have you yet to tell us? And we sit and once again listen in starry-eyed wonderment and sheer amazement. 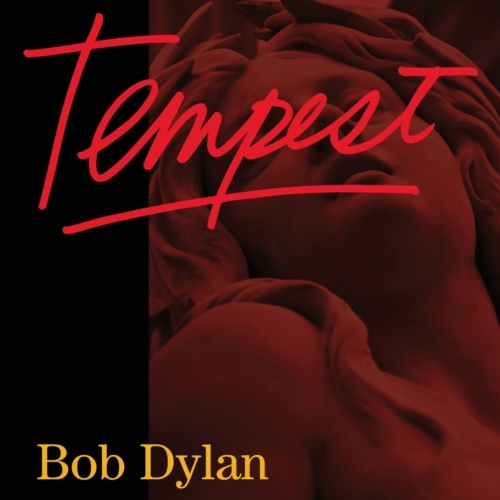 This entry was posted in music, News, Review and tagged Bob Dylan, Masterpiece, Tempest.